This is an activity for parents who aren’t afraid to make a mess! We have a gas fireplace at our house, so Santa must park the reindeer and sleigh on the front lawn and enter via a special key through the front door. 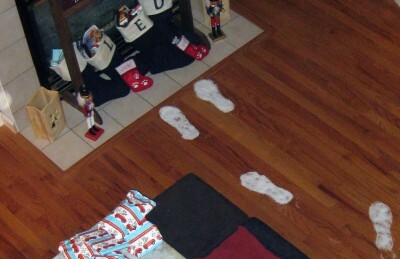 I created Santa and Rudolph’s footprints all over my house. Santa snuck in the front door, but Rudolph and his reindeer friends had to stay outside – they don’t fit down a chimney nor do they belong on my carpet. I secretly hydrated Insta-Snow and kept it in a sealed bin for Christmas Eve night. 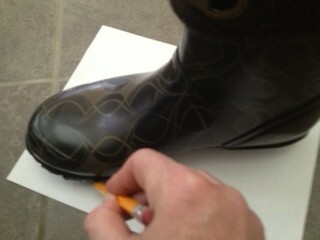 I also cut out reindeer hooves and boot forms. After the girls went to bed, I placed the templates near the fireplace, by the door and outside to make a path. 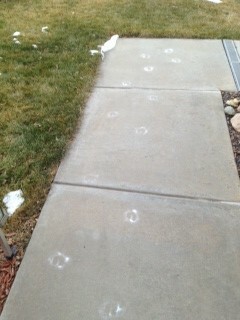 I only left Rudolph’s hoof prints. Creative parents who like to spend tons of time outside in nature can leave all 9 reindeer prints and other traces from the sleigh. 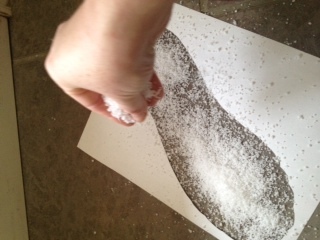 The one debate we have in our office about this little activity is either to sprinkle the snow around the template, like the snow has fallen off the boots and hooves or if you sprinkle it inside to make snow tracks. How you do it is up to you. 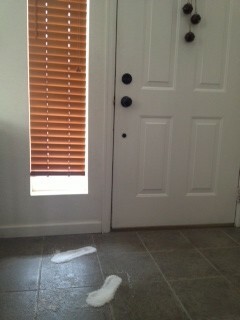 I made tracks in the snow on my sidewalk and then made snow prints inside the house. The best part? The next day when the snow had dehydrated and the footprints were faint. 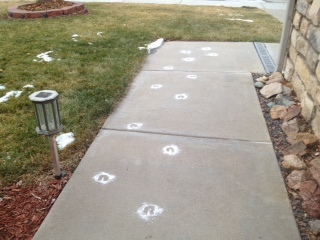 If you are lucky enough to have snow Christmas morning, go the extra mile and make a few sleigh tracks in your front yard! Clean up really isn’t that big of a deal. The Insta-Snow vacuums right up or disappears into grass or the environment. It’s a non-toxic polymer that won’t hurt anything outside.